The Hyper-V Network Adapter sensor monitors virtual network adapters running on a Microsoft Hyper-V host server via Windows Performance Counters or Windows Management Instrumentation (WMI), as configured in the "Windows Compatibility Options" of the parent device. 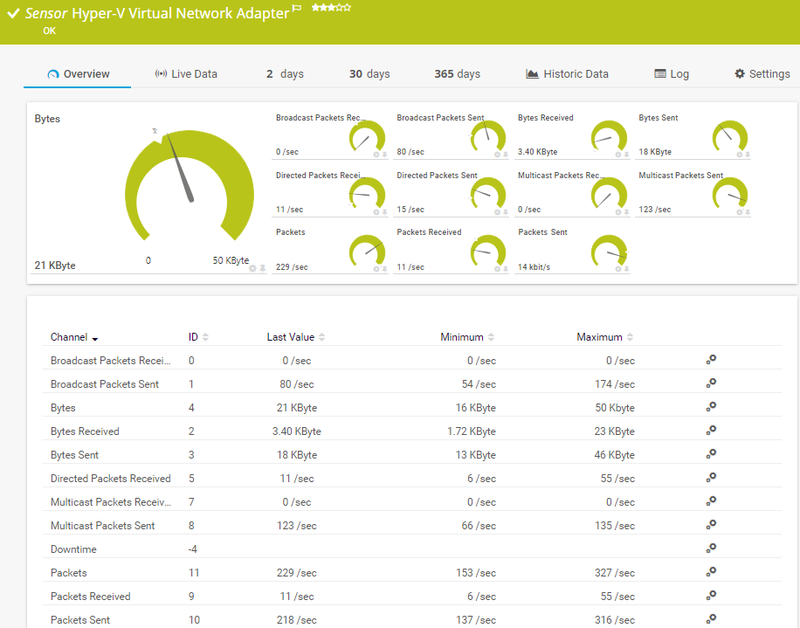 Select the network adapters you want to monitor. PRTG creates one sensor for each adapter you choose in the Add Sensor dialog. The settings you choose in this dialog are valid for all of the sensors that are created. Select the virtual network adapters you want to add a sensor for. You see a list with the names of all items which are available to monitor. Select the desired items by adding check marks in front of the respective lines. PRTG creates one sensor for each selection. You can also select and deselect all items by using the check box in the table head. Note: We recommend that you do not rename virtual machines once you have set up monitoring. Renaming them will also change the internal virtual network adapter names, causing the monitoring to be interrupted. For detailed information about virtual machine naming, please see More section below.